Ashley Fiutko Arico received her Ph.D. in Egyptian Art and Archaeology in the Department of Near Eastern Studies at Johns Hopkins in 2017. Her dissertation examined Egyptian statuary excavated in the Levant. For the ancient Egyptians, goods included in burials had very real effects on their owners’ afterlives. Drawing primarily on rarely displayed highlights from the Eton College Myers Collection, this special exhibition explores different methods the Egyptians developed for ensuring their access to the items that made life worth living even after death. These objects can be divided broadly into two groups: those that were designed explicitly for a funerary purpose, and those that were used in life and then taken with their owners in death. Scientific analysis of the objects, conducted by students in Sanchita Balachandran’s “Examining Archaeological Objects” course during the fall 2017 semester, provided new insights into the contents and use histories of some of the works presented here. I also thank Margaret Swaney, Egyptology graduate student at Johns Hopkin University for her catalog entries on several of the objects exhibited here. Many funerary objects were created expressly for the purpose of addressing the vital needs of the deceased in the afterlife. Chief among these concerns was reliable access to food and drink, which could be achieved through artistic representations of consumables, references to them in writing, or even offerings of actual foodstuffs. Depictions of individuals actively receiving offerings on stelae are accompanied by formulaic texts invoking the king and the gods that ensure a constant supply of requisite goods, while three-dimensional representations of Egyptians at work provide the skills and labor needed for continued food production. Objects used during life could be included in burial assemblages alongside funerary objects. Being buried with personal objects allowed the deceased to take these cherished possessions with them to the afterlife. Items associated with personal adornment, such as the cosmetic items displayed here, were particularly favored. Many of these examples were expertly crafted luxury goods of intrinsic beauty. 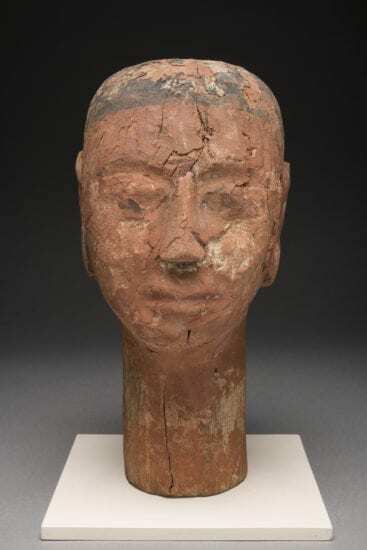 Although it is unknown whether or not the specific examples on display here were buried with their owners, numerous examples like them have been found in funerary contexts, suggesting that this was likely the case. For the ancient Egyptians, boundaries between the realms of the living and dead were permeable, with people’s wants and needs in this life mirrored in the next. Access to food and drink was a primary concern that could be provided for in various ways. A wooden model for inclusion in a tomb depicts men in an eternal state of grinding grain, brewing beer, baking bread, and serving the results of their labors for the benefit of the model’s owner. A funerary stela depicts a man and his wife seated before offerings amassed for their consumption in the afterlife. Miniature vessels and models of similar food offerings (formed from brightly colored faience) underline the importance of such offerings within ancient Egyptian culture. Cherished objects used during life, such as items associated with beauty and appearance, could also accompany their owners to the afterlife through burial. It is thought that the life-sized head exhibited functioned as a wig stand. A selection of cosmetic vessels in a variety of shapes and materials evokes the importance attached to makeup, scented oils, and ointments. A container carved from ebony has an ivory lid that swivels closed to protect the kohl (eye-paint) it once contained. A round-bottomed box, decorated around its exterior with bands of floral imagery, is divided into three compartments for the storage of multiple toilette items to be used either in this life or the next.